So... that's what they got. They also said they wanted chocolate-- and cake pops. They're smart girls. 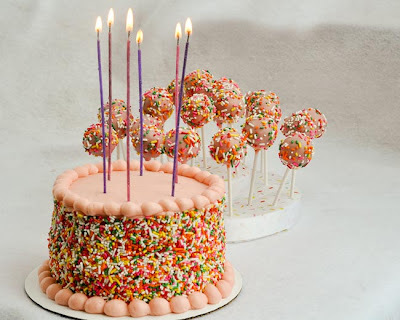 *Side note: I think this cake would be so fantastic as a first birthday cake for a little girl. If you do that... please send me the pictures. I would so love to see it! Anyway! 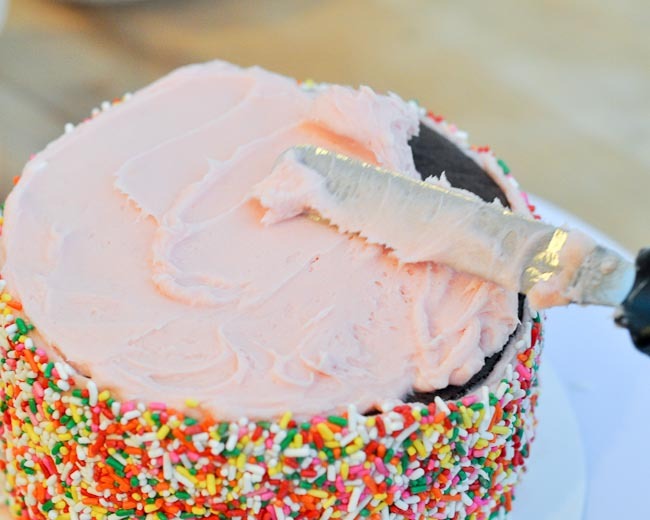 To get the sprinkles on the sides of the cake, start by icing only the sides. You don't have to be particularly even or crumbless, because you're totally covering it! 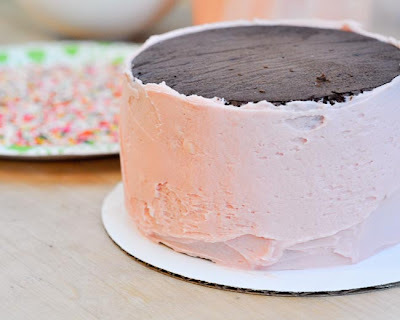 I always err on the side of less icing on the sides than more when I'm going to roll the sides because if you have too much icing, it squishes when you roll the cake, and you have a messier cake to ice the top of. 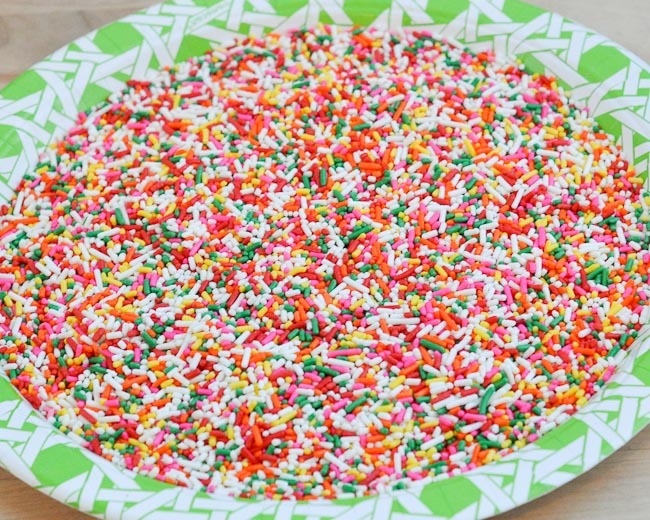 Then, dump all of those sprinkles into a paper plate. (I use paper plates because they're easier to fold to pour the sprinkles towards the middle of the plate, and also so that I can pour the leftovers back in the jar.) 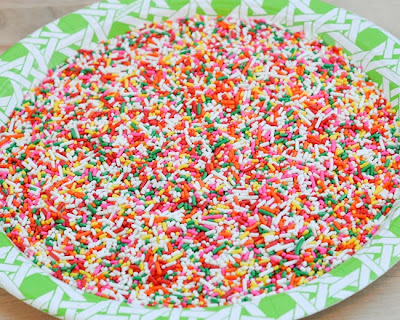 I only used about 1/3 of the large jar of sprinkles for the cake. I'd bet with the smaller bottles you buy at the grocery store, you would only use one whole bottle, but I'd still buy two and pour them both into the plate because the thicker layer you have to roll the cake in, the less chance of it sticking to the plate. Okay, so here's the delicate part. 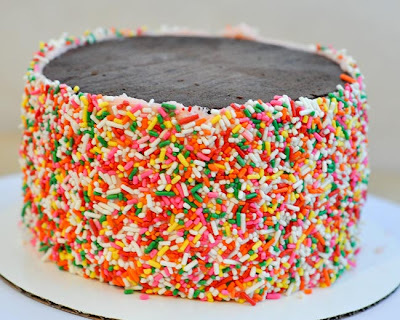 This cake is only 6" in diameter, so it's easier to pick up by hand. 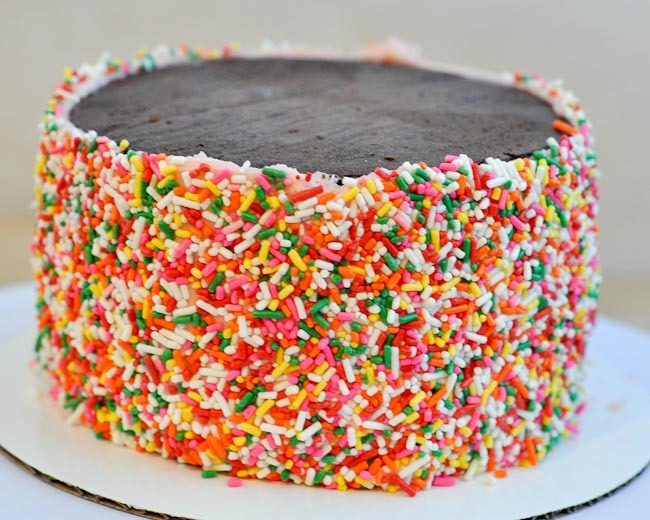 If you have a cake larger than 8", you need to be super careful here not to crack it. Also, a friend or partner around to help here would be really great. 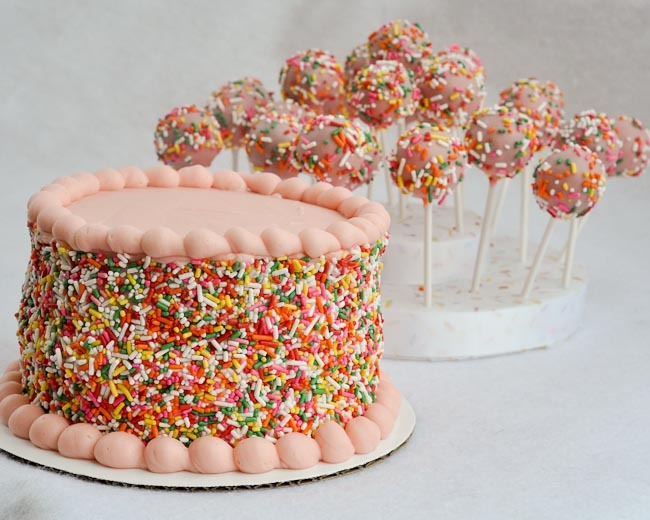 Don't think about literally rolling the cake in the sprinkles. Think about it more like dipping it. So, I dip the one side. 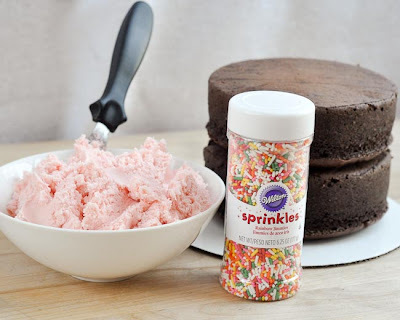 Have the helper shake the sprinkles back towards the middle, turn the cake a little, dip, shake, turn, dip, shake, turn, dip. Hopefully, this is what it looks like in the end. When spreading the icing on the top, be careful of the edges. 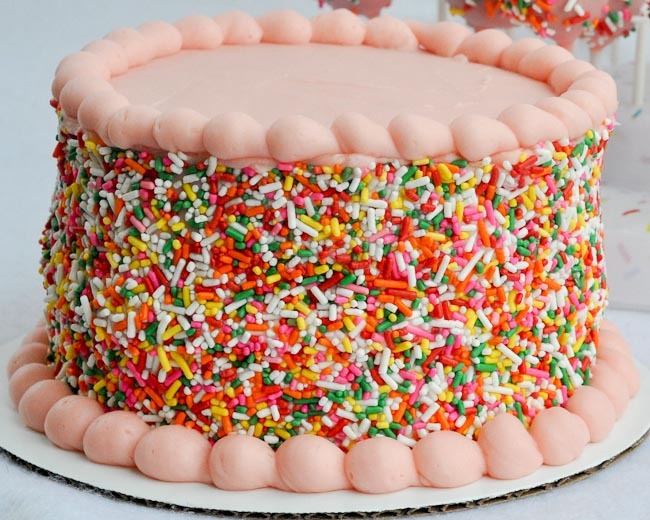 It's hard to keep from getting the sprinkles spread all over the top. But so what if you do!? Just add a few more random ones around and call it intentional. I added a 'bead border' using tip #12 and the same pink icing. I made some pink cake pops with sprinkles to accompany the little cake. 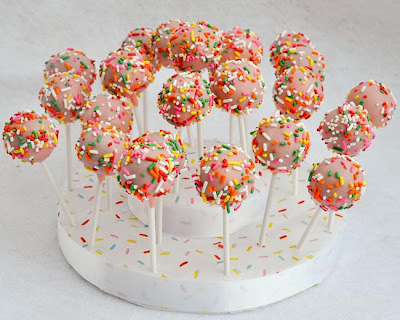 Click here to see my tutorial on how to make cake pops. 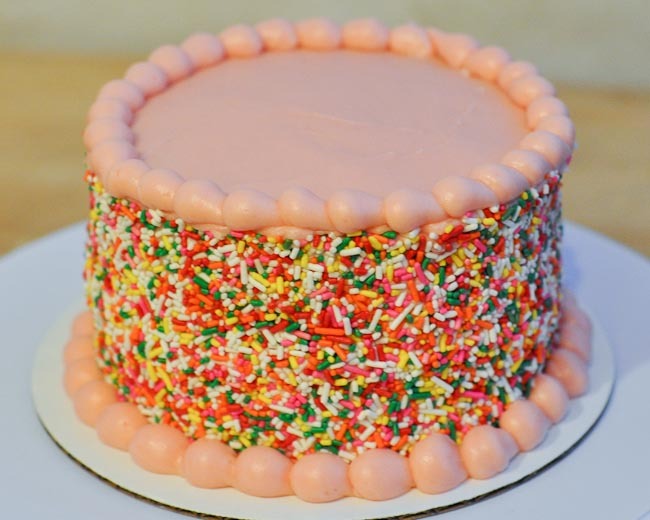 What is it about Chocolate Cake with Pink Icing and sprinkles that makes my heart flutter? This is one beautiful cake my friend!!! 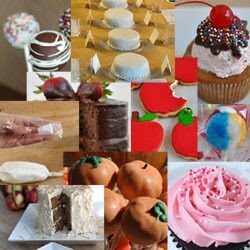 I'm totally going to do this for my baby girl turning one on Sunday! I'll send you a pic when I'm done :) Hopefully it turns out okay! 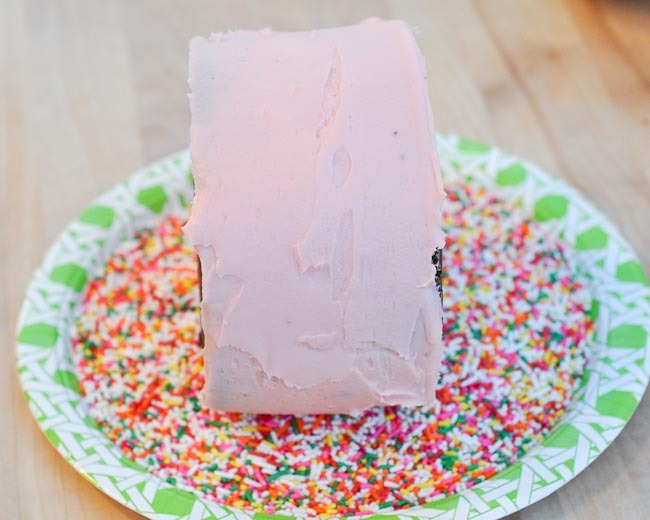 I know this post has been up a while, but did you use a box cake mix? And also, I would really like this color pink icing. How did you get this color? Is it from a can? (I hope so, because that would be great.) I want to do something like this for my little girl who's turning one! And for the icing , I likely used my favorite decorators icing, but with half butter. I don't know if you will get as smooth of icing with the canned stuff, but you can try.